Two tow path turtles that I was lucky to catch last week on my walk while Noah was running. about how much I really like my walks during cross country season. I can listen to talks on my phone or MP3 player and accomplish two tasks at once! I'm getting faster too! I can easily do three miles in an hour - probably closer to 3 1/2 miles now. I am also grateful that I can get up at least two hours before my household does. I find that I really enjoy that time to pray and think before the busy day begins. that I have as many credits as I do - because seriously, if I had to start from scratch on this degree program I wouldn't do it at all! easy does it! Mr. Pete is getting lots of stuff together for grilling this week. On Tuesday we celebrate Gabe's birthday! Cheese cake and buffalo chicken dip are on the menu! For Calvin's Birthday on Friday, Izzy made this delicious and beautiful upside down cake. 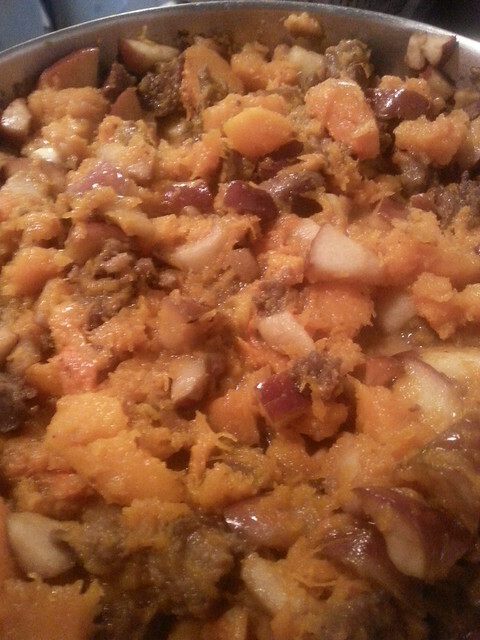 I got adventurous in the kitchen too - this is butternut squash with sausage, apples and pecans with a little bit of butter and brown sugar - very good and even Mr. Pete ate two servings! Black skirt I wore to church and a green shirt from the Jaclyn Smith collection at K-mart that I know I must have purchased at least 20 years ago - but it still fits and I like it! if it's even worth trying to sell on ebay any more. I bought five really pretty girls' dresses at a yard sale for $1 each. So I had $5 into them altogether. It was free listing on e-bay and I started the bidding at $10 thinking that would entice bidders. The buy-it-now price was $30 which I still thought was a great deal for five very detailed dresses. I also offered free shipping. Well there was no bidding and the dress sold for only $12. With shipping and the fees I actually lost money. sigh... it will be a while before I try children's clothing again. I have the app on my Kindle and my cell phone. I am thinking of making my prayer corner a place in my room - but I need to clean a space for it first! Noah doing Expository Writing with Bravewriter. Izzy starts working for the arts project with the city. Rosie is going to work on her spelling and reading and math. Rosie also has cross country. She moved into level 3 for swimming. Michael Medved history talks! I highly recommend his talk on World War I, World War II and Kennedy. Reunions with family members this summer. Mr. Pete cantoring, and my flute in the background. - you can hear Izzy singing too! She was holding the camera. I can tell you that I would never pay you $10 for a used child's dress. If I'm trolling ebay I'm looking for bargains and used kids' clothes are just too easy to find locally for little (like at the garage sale down the street). This was 5 dresses and they were unique. Two of them had very nice embroidery on the front and one had smocking. I thought they were worth it and you would definitely pay more at a store for all five of them new.